I'm really good at over-thinking. I take something that should be simple and muck it up with a bunch of complicated nonsense. I'm going to go ahead and keep believing that I'm not totally strange for doing this. Do you over-think? Maybe just a little? Today, I'm choosing to think a little less. It'll be a day to clean my mental slate and appreciate the mundane daily tasks that require little thought or planning. Perhaps when the day has ended I'll be able to put my feet up and sip on this fresh cilantro-lime gin fizz. Yes, I think that's just the kind of day I need. Whether you need a break from all of the thinking or you are looking to scare away the winter blues, this cocktail is the perfect way to begin the weekend. The recipe is simple, resulting in a clean-tasting cocktail offering a hint of summer in these cold winter months. Even for a winter-lover like me, taking a moment to remember the greener days to come is a welcome escape. 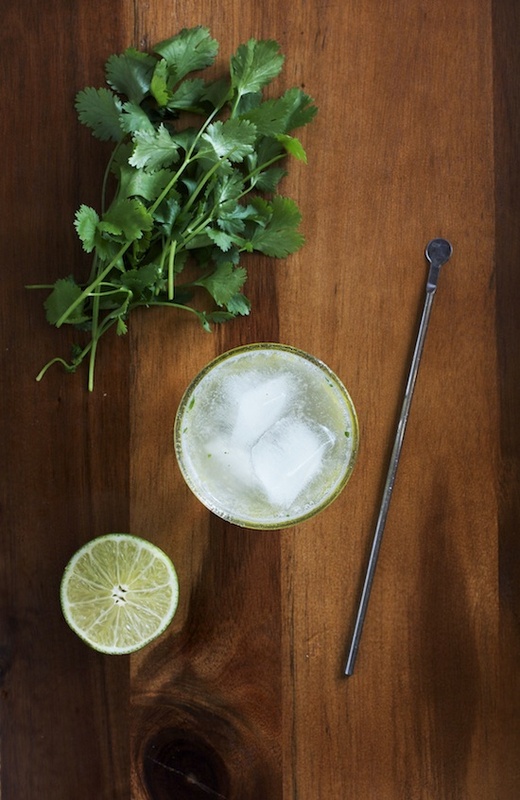 In the bottom of a Collins glass, muddle the cilantro with the honey and lemon juice. Fill the glass to the top with ice, then add the gin. Stir with a stir stick to fully incorporate the honey into the gin. Top with the club soda. Serve with a stir stick and garnish with cilantro leaves and a lime wedge.